We have donated £700 to St John’s Hospice, based in Lancaster, from our Future Story scheme. The money was earmarked for the charity’s ‘Hospice to Home’ service, which provides specialist respite, palliative and end of life care and support for patients and their families within the comfortable surroundings of the family home. St John’s Hospice provides free palliative care to patients with life shortening conditions. Their services cover a population area of 250,000 people in North Lancashire, South Lakes and parts of North Yorkshire. The hospice requires £3.8 million a year with only 30% of this being provided by government funding, so the remaining £2.8 million is raised through events, community donations, grants and legacies. Whilst St John’s Hospice is focused on helping adults aged 18 years and over to get the most out of every day regardless of their ability, its highly specialised care team can also provide support at home. 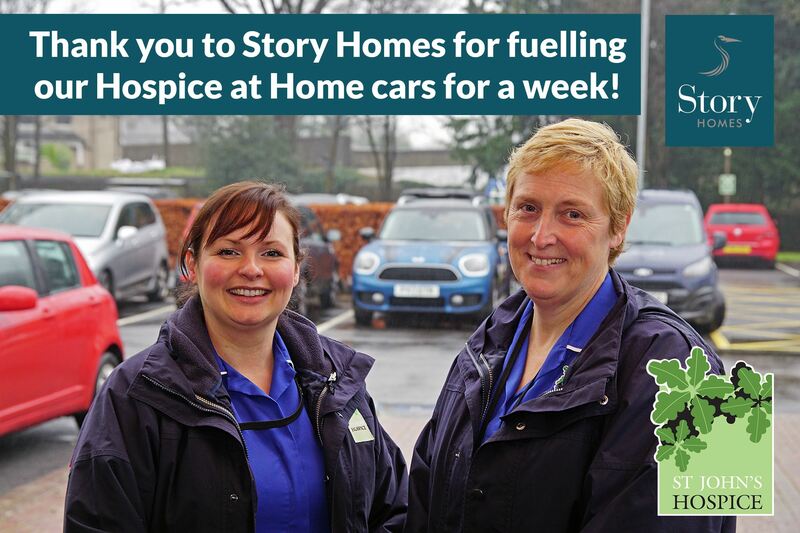 Over the Easter period, the ‘Hospice at Home’ team travelled as far as Garstang in the south, Sedbergh in the east and Ambleside in the north supporting every corner of the community as well as the bits in between! St John’s Hospice Community Fundraiser Rachael Makinson said, “With vehicles fuelled by Story Homes, the team were able to visit patients in the comfort of their own homes to administer symptom management as well as giving much needed support and advice to help our patients and their loved ones. “During the week the ‘Hospice at Home’ team worked as ever around the clock, 24 hours a day seven days a week offering first class palliative care and giving that extra comfort and support to patients and families when they need it most. David O’Reilly Land and Planning Director NW said: “The care and support offered by St John’s Hospice to patients and their families is truly priceless and we are delighted to be able to offer our support by making the donation through our Future Story scheme to fund their ‘Hospice to Home” service.